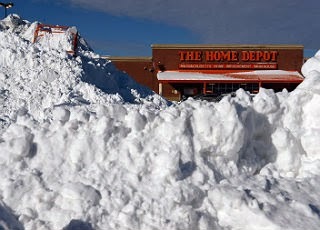 The recent snow storm in the Northeast caused quite a bit of inconvenience, as all winter storms will. But in these times it seems as though the bark has become far worse than the bite. The media leads the way. The Weather Channel has independently begun the practice of naming common winter occurrences in the same way hurricanes are labeled. It’s nothing official, but it sure sounds as if it is…”Winter Storm Hercules.” Blizzard conditions are approaching. Woo! Who wouldn’t be persuaded that this must be a big one? Following right behind the media are the politicians and their cohorts who insist on exacerbating the hype by closing roads, closing schools, shutting down public transportation, declaring states of emergencies and demanding that people stay in their homes – all before the first flake falls. As a result, by the afternoon prior to the storm, I found the neighborhood supermarket parking lot overflowing with 4 wheel drive SUVs. The lines to the checkout counters spilled into the aisles. The bread was gone. The eggs were gone; as was the milk. Stranger yet - the meat was gone. No meat in the market? The big one is surely approaching. The people need to stock up on provisions. Who knows when food will be available again? Long gone are the days where officials and citizens waited to see what actually would happen as a result of snow fall. The days for example where school closings were announced only after the impact of the event could be evaluated. I’m talking about a time not so long ago when drivers determined their pathways and people were trusted to make rational decisions about where and when to stay and when and where to go. For now and for the foreseeable future, media driven panic will replace most reason and rational thought, with peoples’ lives ever more controlled by the medial and those in positions of authority. Americans have become a very spooked group of people, easily manipulated by the forces around them, and unfortunately weakened in that process. While I write, the snow has fallen. And the impact is self-evident. When I peer through my window I see snow; several inches perhaps – really not that much. As I step on to the porch I can feel the temperature is cold, exacerbated somewhat by a northerly wind. It is winter after all. Judging by what I see, I will have, by late morning, cleared the snow from my driveway and car (rear wheel drive). I will go to a near-by 7-11 and purchase today’s papers – assuming they have allowed the delivery trucks to pass. Later, I will walk to my local and visit my bartender – who, by the way, always finds a way to make it to work on time. In his view he is one of those essential workers we hear so much about. I tend to agree with him. Consider this: inhabitants of the northeast should keep a winter storm warning in their minds for the next couple of months. For this is only early January which means the snows of winter are very likely to return. My suggestion is to keep a good shovel handy, have a window scraper in your car and don’t be afraid to throw a few snowballs. And the next time you’re in the supermarket – between storms – pick up a few extra steaks and keep them in the freezer.